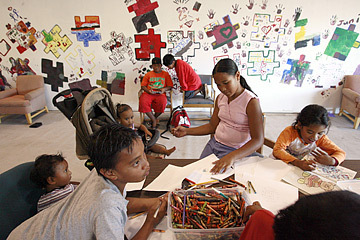 Children utilize the Keiki Corner at the Next Step homeless shelter in Kakaako. Nearly 100 children live with their families at the shelter, which is looking for banquet tables, chairs, shelves, art supplies and books for the kids to use. A 6-year-old boy drew a star while lying between seven family members crowded into a 5-by-4-foot wooden cubicle at a homeless shelter in Kakaako. It was a recent Friday evening, and dinner had been served at the state-run shelter, home to more than 200 people, half of them children. All of the them had been displaced by the city from Ala Moana Beach Park earlier this year. With so many children playing and running around, the shelter is often a boisterous place but not the most ideal environment for them. And with few resources and nowhere to play, children and their parents have looked to people on the outside for help -- a call that has not been completely heard. "When I first came here, the kids were out of control," said Kathryn Obra, a volunteer who started working with adults when the shelter opened in April. "It was like one big playground." Obra said there was not much discipline, and saw roughhousing among the homeless children, who ran up and down the 36,000-square-foot warehouse. "I think they just needed structure in their lives and someone to follow," said Obra, who devoted her free time in the following months to teaching the children. One of them was the 6-year-old who learned to draw stars from her. On Friday, sheets of paper with rows of stars covered his cubicle floor, a surface he used out of necessity. It has not been easy finding volunteers -- or art and educational supplies to keep them busy. Because there are not enough chairs and tables at the shelter, children are forced to do everything on the floor. In turn, that has kept many of the senior citizen volunteers away because it is physically difficult for them to sit with the children. Despite the challenges, Obra said she has already seen changes among her young students. "Before, I'd get kicked and punched, but now, it's all hugs and kisses from them," Obra said. Because most of the children cannot read and write, Obra set up a corner where she reads to them and helps with arts and crafts, using books and supplies from home. These hands-on activities brought a positive change in their behavior, Obra said. Six donated computers will also give the children an opportunity to learn as they participate in various virtual educational programs. Recently, the children painted a mural to show where the Keiki Corner will be. The corner should be finished by Thursday, said Rita Martin, of the Affordable and Homeless Housing Alliance. "The mural really brought out their personalities," Obra said. "It's like a universal puzzle, where each kid is a different piece." Obra plans to have three separate areas for arts and crafts, tutoring and reading. The age of children in the shelter ranges between 6 and 12 years old. "She's like their big sister," said Obra's sister Jessica, who also volunteers at the shelter. "They really look up to her." Some children in the shelter believe a tutoring program would be helpful in the summer, as the majority of them attend summer school. The number of homeless children in Hawaii schools has increased over the years, said resource teacher Judy Tonda, of the National Center for Homeless Education. In 2004 about 945 homeless children age 5 to 17 attended schools in the state. Last year, that number increased to about 1,000. And because of their difficult circumstances, children often do not get help from their parents. "I so tired when I get here," said the 6-year-old boy's mother, who did not want to be identified. "I work all the time and have to take care of my babies." There are language issues, as well. Tonda and her team interviewed each family in the shelter and found that many children fear the language barrier between their teachers and classmates since most moved to Hawaii from Pacific islands. "My grandma don't understand how to do the work," a 9-year-old girl from Guam said. "She doesn't speak English that good." Keiki Corner Kickoff: Each child will receive a backpack with school supplies on Thursday during a kickoff ceremony for the Keiki Corner. Birthday Movie Nights: Children will celebrate their birthdays on the last Saturday of their birthday month with cake and a movie. There will be a different theme each month. This month's event, which includes a lion dance and showing of Walt Disney's "Mulan," is scheduled for July 29. Sunset on the Waterfront: Like the city's Sunset on the Beach in Waikiki, adults can enjoy a movie and popcorn at the shelter twice a month. Book/Toy Store: Children will be rewarded for positive behavior and learn early financial management with access to a shelter store. They receive play money for doing a good deed, which they can use to buy books and toys. Clothes Closet: A clothes closet with career attire will be provided for adults applying for jobs. To donate or to volunteer at the Keiki Corner, call the Affordable Housing and Homeless Alliance at 845-4565.